Like the casserole, but better. This sautéed green beans recipe pairs the fresh veggies with savory mushrooms and crispy shallots for a dish that you'll probably want to double. 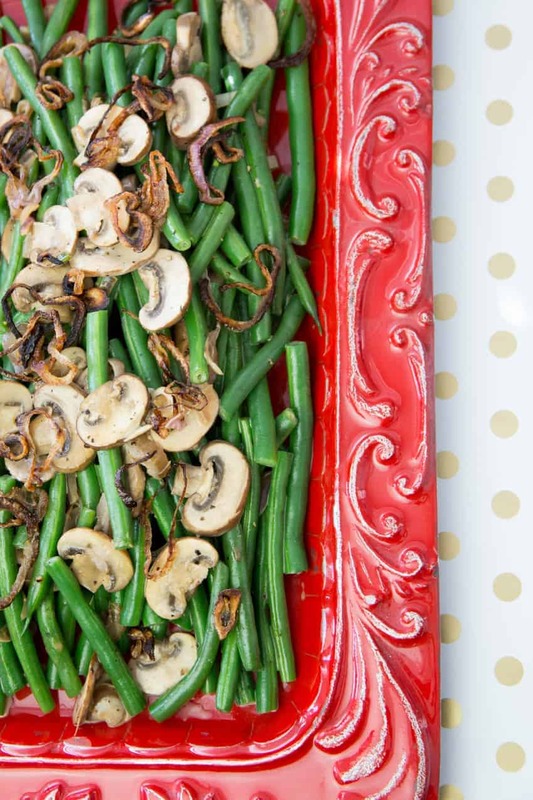 Sautéed Green Beans with Mushrooms and Crispy Shallots is a crowd-pleaser. You may want to make a double batch. Here’s my fresh and delicious take on the standard baked green bean casserole. 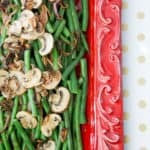 I’ve served these Sautéed Green Beans with Mushrooms and Crispy Shallots several times, and always gotten rave reviews. In fact, the recipe was featured in GFF Magazine because the founder liked the green beans so much! The recipe also has a dairy-free option, which makes the dish Paleo-friendly too. I add a little tapioca starch to the sauce to make the texture a little creamier, but if you like it a little thinner, feel free to skip that step. The recipe is delicious both ways. If you love the French Fried Onions from a can, you can leave out the crispy shallots and use those, or smother the sautéed green beans with both. I won’t even judge you. Of course, those GF onions always get to be a sold-out circus during Thanksgiving time, so I’ll even provide a couple of options on Amazon for you: try these from Live GFree or these, if those are sold out. *If you’re working on a holiday menu, check out my Sweet Potatoes with Gingersnap Cranberry Crumble, fabulous Pumpkin Cheesecake and Torta Gianduia (chocolate hazelnut cake) – they’re all showstoppers too. Heat oil in a large skillet over medium-low heat. Add shallots and cook, stirring often and being careful not to let them scorch, until medium-golden brown, 10-12 minutes. Remove with a slotted spoon to a paper towel-lined plate and season with salt and pepper. The shallots will crisp up once they cool. Discard oil, skillet may be used for the rest of the recipe. Bring water to boil in a large saucepan, blanch fresh beans until just tender (about 5-6 minutes), drain. Heat 1 tbsp olive oil over medium heat in a large nonstick skillet. Sauté shallots, stirring occasionally, until tender and beginning to brown, about 2-3 minutes. Add the additional olive oil to the skillet and add mushrooms and sauté, stirring occasionally, until golden brown, about 6 minutes. Whisk the tapioca starch into the stock, and then add the mixture to the skillet and reduce the heat to medium. Cook until thick, about 3 minutes. Remove from heat, stir in yogurt, salt, and pepper. Add beans and toss. Top with crispy shallots and serve warm. This entry was posted in Dairy Free, Paleo Friendly, Recipes, Side Dishes and tagged dairy free, dinner, food allergies, G-Free Foodie, gluten allergy, gluten free food, gluten free holidays, in season, paleo, paleo friendly, Thanksgiving. Bookmark the permalink.